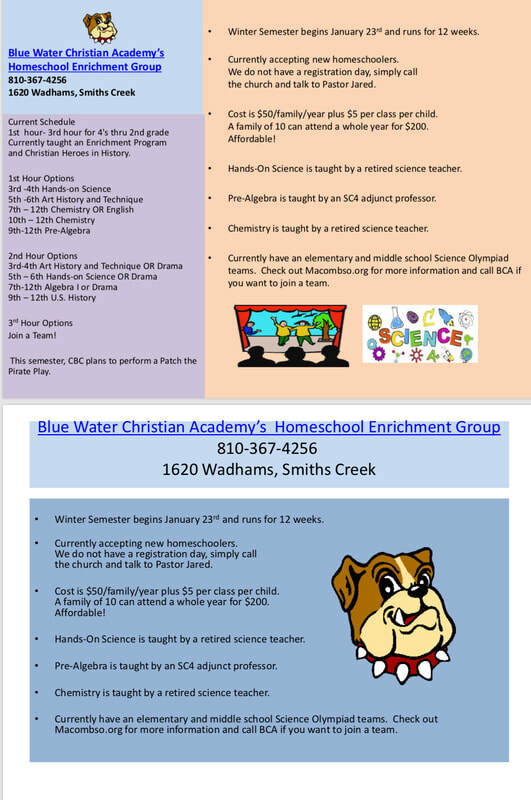 On this page, you will find information about some of the many opportunities that are available to homeschoolers in our area. If you know of an opportunity that we don't have listed here, please contact us so we can add it! Jane Weis, artist located in Yale, MI. Mixed media art classes including paint, clay, pastels, collage. Cost: Minimum 3-week session for $32. Excel is a private, voluntary, Christian cooperative consisting of individual homeschooling families sharing time, expenses, and resources to provide cooperative educational experiences for our children. It is, above all else, Christian, and is governed by the Word of God and the principles found therein. Algebra, Anatomy, Art, Astronomy, Biology, Chemistry, Choir, Christian Manhood/Womanhood, Christian Worldview, debate, Drama, French, Geometry, Geography, Grammar, Health and Fitness, Literature, Penmanship, Photography, Scrapbooking, Sewing, Sign Language, Spanish, and other creative classes. Excel offers two 14 week sessions each school year. 11:30-12:00 for fellowship/lunch if you would like to bring a lunch for your family. Blue Water Christian Academy is located within Community Baptist Church. It is a church school that uses the Abeka curriculum. Under their academic umbrella, they are forming a home school group, one of the benefits of which will be the formation of sport teams consisting of home school students and Academy students. The mission of Blue Water Christian Academy’s Home School Group, for kindergarten thru twelfth grade, is to provide high quality High School level academics, drama club, Elementary Science Olympiad, MACS Performing Arts opportunities, elementary art, elementary hands-on science, MACS Athletic competitions, and graduation ceremonies for home school families all with the intent to glorify God in everything we say and do, and to provide a Christian community support network that offers team experiences that are completely free of public school influences. Winter Semester begins January 23rd and runs for 12 weeks until April 24th. Tuition: $50 per family per year and $5 per class. Sports cost $100 per sport. Cost: $5 per child/per class. No registration required. Class meets Thursdays 12:00-2:00PM and is for 1st-12th grade students. Involves one hour of group sports in the gym & one hour of swimming. Non-members check the YMCA website for 6-week session pricing. Members: free. *Payment due every 6 week session. Registration is required through the gym. Call the church for registration information. Lesson prices vary ~ contact Port Huron Music Center for more information. ECS concerts are designed for school groups of students in grades 1-8 and feature an economical ticket cost per student (last year it was $6/student.) Home educators are welcome to bring their own children/students by registering as a "home school". You can read more about the concert series and register by clicking HERE. Past programs have included themes such as “An Instrumental Safari”, “Risky Business: a Musical Look at Exploration, Innovation and Character” and "What Makes Music Popular?" Performances last approximately 45-50 minutes and take place in Orchestra Hall. Whether your child is in need of some extra help for one of his/her current classes, you are in need of curriculum guidance, or you would like someone to create and teach your child any English or Sociology related classes, I can help! I have been a certified teacher since 1994. I earned my Masters in Educational Leadership in 2002. Lessons are tailored to each child’s needs. Both on-line and in person classes available.